Hips: OFA “Good”, Elbows: OFA ” Normal”, Heart: OFA “Normal”, Eyes: OFA “Normal” Ichthyosis: “Carrier”, prcd-PRA status: “Clear by Parentage”, PRA1 status: “Clear by Parentage”, PRA2 status: “Clear”, Degenerative Myelopathy, “Clear”, Dystrophic Epidermolysis Bullosa, “Clear”, Muscular Dystrophy, “Clear”, Osteogenesis Imperfecta, “Clear”, Sensory Ataxic Neuropathy, “Clear”, Neuronal Ceroid Lipofuscinosis (NCL), “Clear”, these test were preformed by “Paw Print Genetics”, you can go to there website for a great explanation on each. 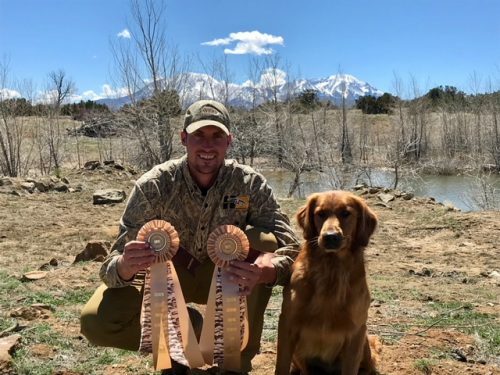 Fun weekend attending the Southern Colorado HRC annual Spring Hunt Test. Congrats to Max for earning his first two Started Passes!! 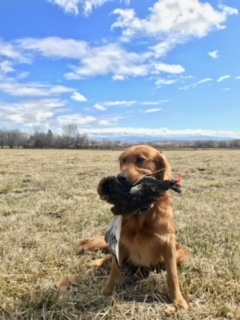 Achievements: Max is a blessing to our breeding/hunting program, he has champion working lines top and bottom that will compliment our females to make great family dogs as well as great field/working dogs. 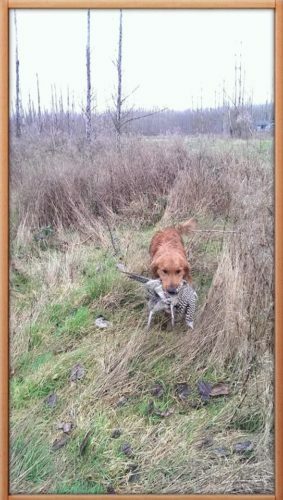 Although he does not have any hunt titles yet he is excellent in the field and water, retrieves very well and love birds. 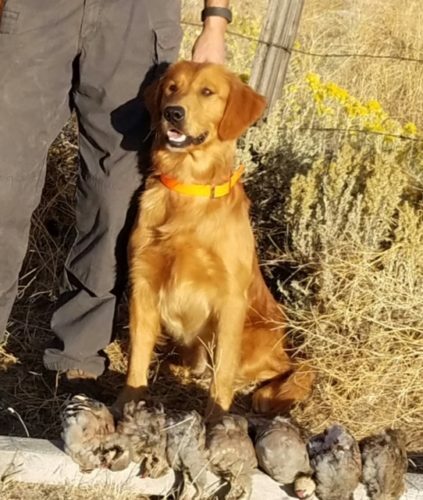 Max is eager to please, has great prey drive and loves to work. 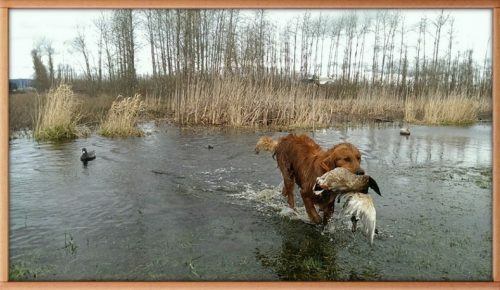 Max quarters nicely, putting on a smart and productive hunt. 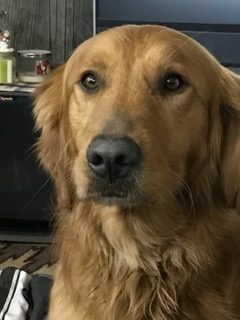 Max has his AKC Canine Good Citizen Certificate and great house manners. We are very excited to ad him and his offspring! “Max” is available for stud service, contact us for the requirements on your female. Max’s sire “Semper Cooper’s Mulligan CCA *** is a young up and coming male, owned by Lee Herkowitz in Oregon, who is already showing his talent by earning placements in the Derby and earning numerous JAMs in the Quals. 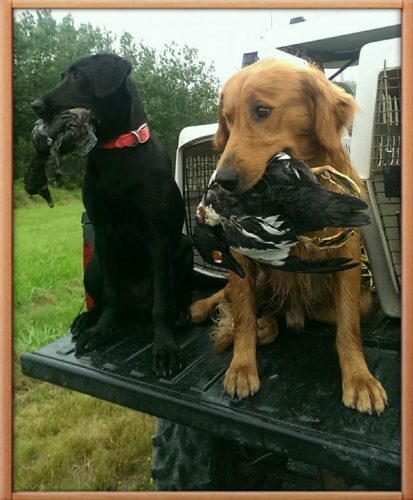 Mulligan also ran one AKC Master Hunt Test for a pass and should have no trouble earning his title. 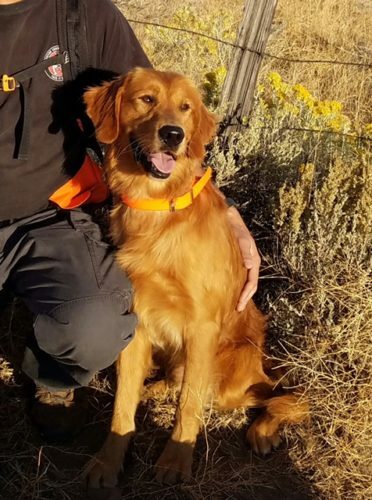 Mulligan is continuing his training this year, we can’t wait to see what he accomplishes! Mulligan is also physically correct and earning the CCA Title, (Non-Competitive Conformation Assessment). Max’s dam, Skyriver’s Genuine by Design, JH has looks, brains, and drive in the field. 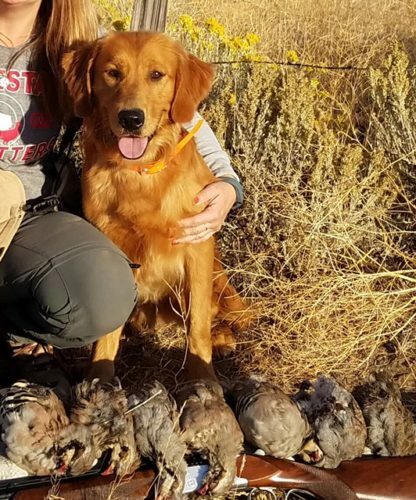 Sweet and sensible, she loves birds and had her first hunting season at under a year old, finding and flushing pheasants in the sand and sage of central Washington. 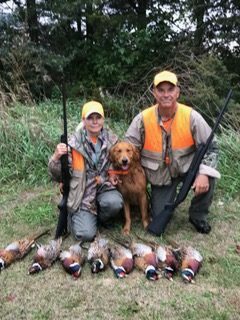 She earned her AKC Junior Hunter title in 4 for 4 passes, with grace and enthusiasm. She has an excellent nose and hunts intelligently with strong perseverance. Her sire is CH. 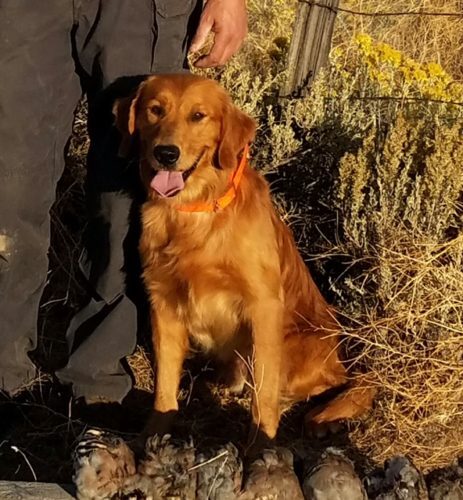 Malagold Augusta’s Genuine Article, CDX, MH, WCX, VCX, DDHF, “Levi” is one of the very few Goldens that has earned the elusive titles of AKC bench Champion, Master Hunter, Duel Dog Hall of Fame and many others! 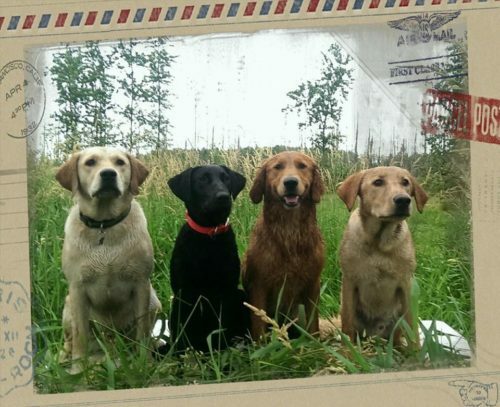 “Max” at a 13 months out hunting and posing with the labs!